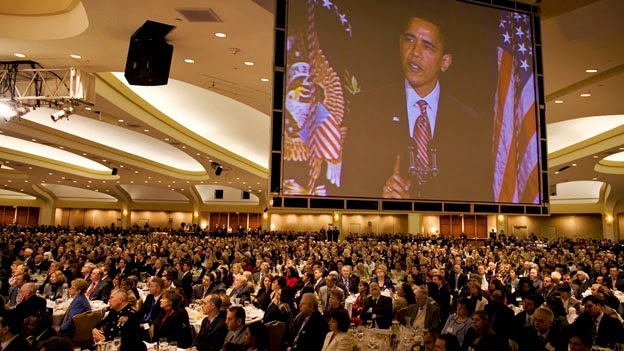 Every president of the United States since Eisenhower has been a featured speaker at the National Prayer Breakfast, validating and bolstering the influence of the theocratic organization that sponsors it. With rare exceptions, mainstream media treats this as completely uncontroversial. Because The Family doesn’t just work with hardline conservatives. It’s also happy to work with moderates and liberals, Republicans and Democrats, anyone who will help further its work of Christianizing the ruling class. Hillary Clinton, for example, has had a close relationship with The Family for a decade or more. For decades, some far right opponents of the U.S. empire have been trying to make common cause with leftists. They got another opportunity in December 2014 at an international conference in Moscow on the “Right of Peoples to Self-Determination and Building a Multi-Polar World.” The conference was organized by the Anti-Globalization Movement of Russia (AGMR). Participants included U.S. leftists from the United National Antiwar Coalition (UNAC) and the International Action Center (IAC) -- both of which are closely associated with the Workers World Party -- alongside Russian and Italian fascists and U.S. white nationalists from the neo-Confederate group League of the South. It’s worth looking at this convergence in some detail as it speaks to an important pitfall confronting leftists involved in anti-imperialist coalitions. UNAC and IAC articles about the Multi-Polar World conference portrayed it as a progressive event against war, racist violence, and repression. The IAC reported, “Major themes of the discussion were the US-backed war against the people of Donetsk and Lugansk in eastern Ukraine, the expansion of NATO into the former Soviet Union and economic war against Russia, Venezuela and Iran, and the ongoing uprising against racism and police brutality in the United States.” Neither IAC nor UNAC mentioned that a number of far right groups were represented. UNAC did note that attendees included Israel Shamir, “a leading anti-Zionist writer from Israel,” but didn’t mention that Shamir is also a notorious antisemite. It’s unclear to me how close the relationship is between the Anti-Globalization Movement and Dugin, but members of the Duginist Eurasian Youth Union took part in the AGMR’s December 2014 conference and have worked with AGMR at other events. Like Dugin, the AGMR envisions a broad alliance of political forces against U.S. imperialism, ranging from grassroots social movements to Communist Party states to right-wing dictators. The lynchpin of this alliance is Russia. The AGMR website features a list of seven “Faces of Antiglobalization,” almost all of whom are or were friendly with Putin’s government: Belorussian president Alexander Lukashenko, Syrian dictator Bashar al-Assad, Iran’s ex-President Mahmoud Ahmadinejad, the late Muammar Gaddafi of Libya, Venezuela’s deceased left populist president Hugo Chavez, and Cuba’s Fidel Castro. The one outlier on the list -- and only non-state figure -- is Subcomandante Marcos of the Zapatista Army for National Liberation, whose 1994 uprising was a pivotal event in the global justice movement’s development. The AGMR position statement also includes a lot of language about tolerance and self-determination, for example, “respect for other peoples and their sovereignty, value systems and lifestyles.” Such phrases appeal to both leftists and liberals, but are also favored by the neofascists of the European New Right (ENR), who have replaced traditional fascist talk of national or racial supremacy with slick appeals to “ethno-pluralism” and “biocultural diversity.” Aleksandr Dugin is the ENR’s leading representative in Russia. On one of its web pages, AGMR also gives a hat tip to the Lyndon LaRouche network as some of the “like-minded people” from around the world who took part in conferences that laid the groundwork for the AGMR’s founding. The LaRouchites promote a quirky crypto-fascist ideology and in recent years have become increasingly aligned with the Russian government on geostrategic issues, for example echoing a pro-Russian line on the civil wars in Syria and Ukraine. In addition to the Duginists from the Eurasian Youth Union, the December 2014 Multi-Polar World conference also included representatives of the right-wing Rodina Party (which in 2005 was barred from participating in Moscow Duma elections for inciting racial hatred against immigrants) and the Italian neofascist group Millennium, which has had a close relationship with Dugin’s organization for several years. In December 2013, AGMR head Alexander Ionov spoke at a Millennium-sponsored far right conference in Milan. The Multi-Polar World conference also drew representatives from Novorossiya, or New Russia, the entity in eastern Ukraine that, with Russian backing, has declared its independence from Kiev. The UNAC/IAC folks portray the Ukrainian conflict as aggression by neonazis and U.S. imperialists against the people of eastern Ukraine – utterly ignoring the Russian far rightists who are heavily involved in the eastern separatist movement, as well as the Russian government’s own expansionist aims in the region. In an email reply to Pollack, Lombardo wrote that the AGMR supported gay rights and its leaders denied having joined any anti-gay demonstration. Lombardo also stated that the Multi-Polar World conference organizers strongly repudiated the views of the Texas secessionists who attended, and that the organizers’ participation in a Black Lives Matter solidarity protest at the U.S. embassy proved they oppose racism. Maybe the Anti-Globalization Movement of Russia’s extensive contacts with fascists and right-wing nationalists result from bad judgment rather than ideological affinity. Either way, their Multi-Polar World conference provided a useful service for far rightists who want to sanitize their image among liberal and leftist audiences. Unfortunately, UNAC and IAC aren’t the only leftists willing to play along with this. Marxist academician Efe Can Gürcan, for example, recently discussed Eurasianism (specifically including Duginism) as an ideological challenge to NATO and US imperialism, but didn’t mention that Aleksandr Dugin is a fascist. When I objected, Gürcan replied that “One should not avoid potentially transformative dialogue with such movements [as Dugin’s] merely because they are not leftist or because their practices are in some areas objectionable” (Socialism and Democracy, March 2014, p. 170). As a self-delusional rationale for red-brown coalition building, this is hard to beat. Special thanks to Michael Pugliese for pointing me to much of the information in this post, and to Andrew Pollack for permission to quote from his UFPJ-Activist memo.